Contrasting colours are a real trend when it comes to kitchen flooring and flooring in general. Using lights with darks is a major flooring trend, black and white work great together and grey is a great middle ground (quite literally). Grey is a colour that can go with most things, alongside black and white, it’s very modern and an ‘in’ colour right now. It can have the effect of giving an authentic, elegant and stylish. You can combine black with light wood or other light colours to make it feel more homely. 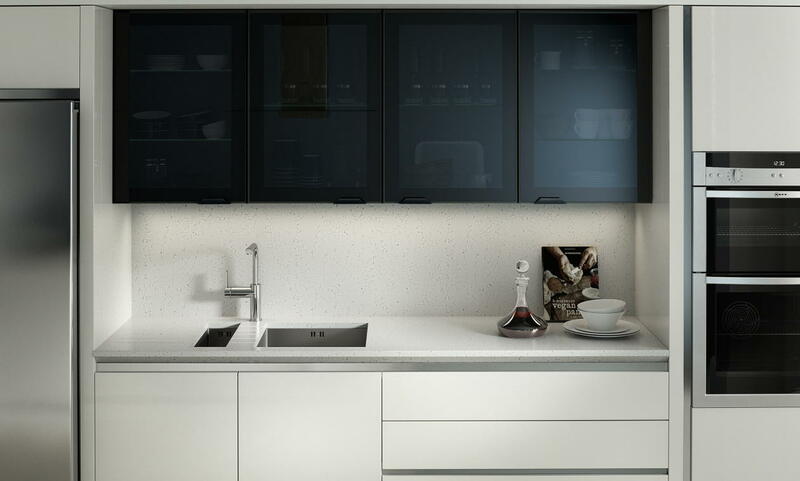 Black is one of those colours you can use with anything, sometimes it can be tricky to get right in a kitchen. You don’t want the room to look too dark but on the same hand, any dark coloured surface portrays a sense of elegance or luxury. White is white, it can be used anytime and anywhere, especially in a kitchen. You can use the colour white to contrast against things in your kitchen to make them stand out. The only problem people have with using white is that if anything spills it can be easily shown, using grey or black as a flooring option can be a much safer option. Hardwood is one of the most preferred flooring materials across homes, the reasoning is because its versatile in colour and can change in texture and finish. This means you can change and adapt the material to suit everyone and their needs. Although it is quite expensive, it lasts a long time and is low maintenance meaning after the initial cost you don’t need to spend much more money. One of the biggest advantages of hardwood floors is that hardwood flooring is extremely safe and clean, this means you don’t have to spend hours cleaning and it’s kid-friendly. Another advantage of hardwood flooring is that it is sustainable meaning it using abundant materials making it eco-friendly! Distressed materials are not only a trend with clothes right now but also with kitchen flooring. Wooden decking purposeful worn and distressed has a big effect on the kitchen space, especially using darker shades of wood. 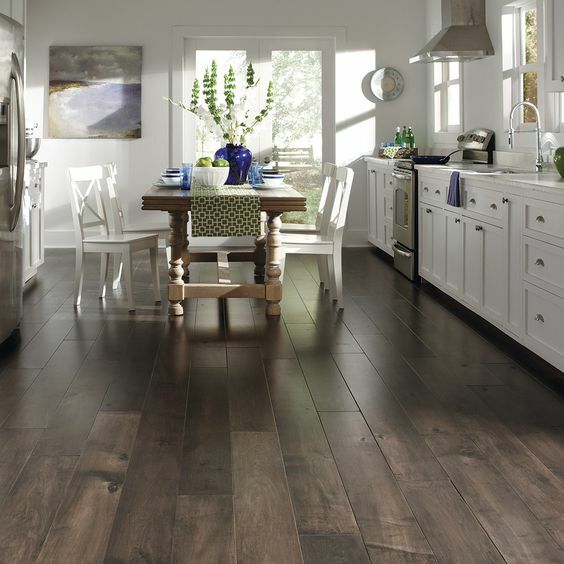 Distressed wood has been called modern rustic, it’s a contemporary style that gives the house and floor natural beauty. 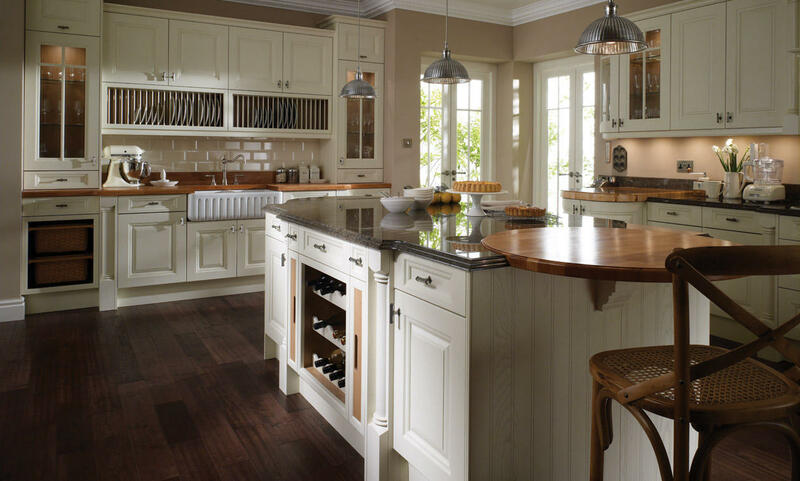 Many types of woods are purposefully distressed during production to achieve an expensive modern feel, it, however, has a negative impact on space so you need to think carefully about where things are placed to think about the visual space of the kitchen. Engineered vinyl planks are a big trend at the moment and although they are artificial, they look and feel like real wood. 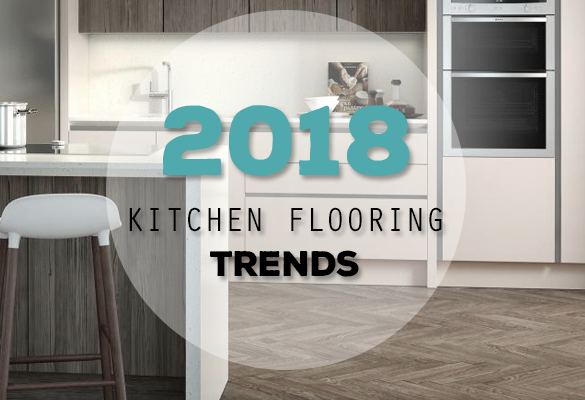 Rather than using stains like real hardwood, vinyl floors are made waterproof which is why they are becoming so popular within kitchens, spillages won’t affect the actual material. 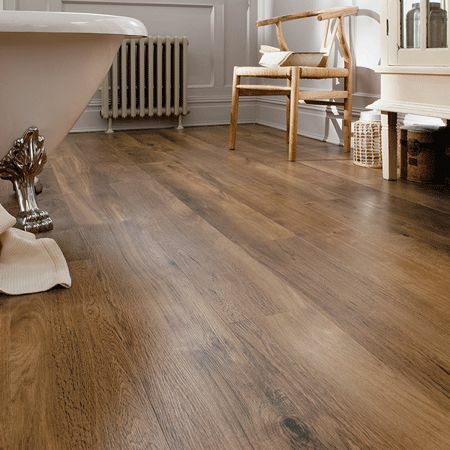 Vinyl planks are easy to maintain as they are just wiped clean as it doesn’t absorb water or any other spillage. It is a floating floor, this means that vinyl can be installed on top of almost every surface, with this comes luxury vinyl designs that may appeal to many home décor styles.